NEW! Our latest LED candle collection is made of ivory wax, poured into shimmering champagne hued glass jars. The LED flame technology creates an incredibly realistic and subtle flicker which glows 250 hours per set of AA batteries. Set convenient timers and adjust the glow with the optional remote control, sold separately. 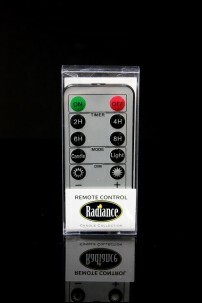 RADIANCE RECHARGEABLE TEA LIGHTS SET OF 4 W/REMOTE (478245) ..
RADIANCE POURED CANDLE 6x6" CHAMPAGNE REMOTE CAPABLE REMOTE IS REQUIRED TO OPERATE TIMER'S ..
RADIANCE POURED CANDLE 6x7.8" CHAMPAGNE (478247) REMOTE CAPABLE REMOTE IS REQUIRED TO OPERATE..
RADIANCE POURED CANDLE 6x9.8" CHAMPAGNE (478248) REMOTE IS REQUIRED TO OPERATE TIMER'S ..
RADIANCE 10 BUTTON REMOTE CONTROL (478200) FEATURES INCLUDE ON/OFF 2HR / 4HR / ..